The western pretty much trotted into the sunset decades ago, but every once in a while something gallops out of Hollywood that reminds us just what a big deal cowboys used to be. And the cowboy, as depicted and polished by Hollywood and pop culture, remains one of America’s most potent mythic figures—a rugged, rustic, stoic, individualistic, self-sacrificing hero, good with a gun and sometimes even better with women. The Magnificent Seven gets a lot of its retro dust honestly. For starters, it’s a remake of a remake: The original Seven, in 1960, was an all-star Americanized version of a 1954 Japanese classic, Seven Samurai, in which a samurai warrior and six others band together to defend a village from marauding bandits. Director Antoine Fuqua certainly knows how to make an action-packed project click into place, with clear-cut lines between good guys and bad guys, a lofty morality-lesson overlay and a dark undertow of bloody revenge. 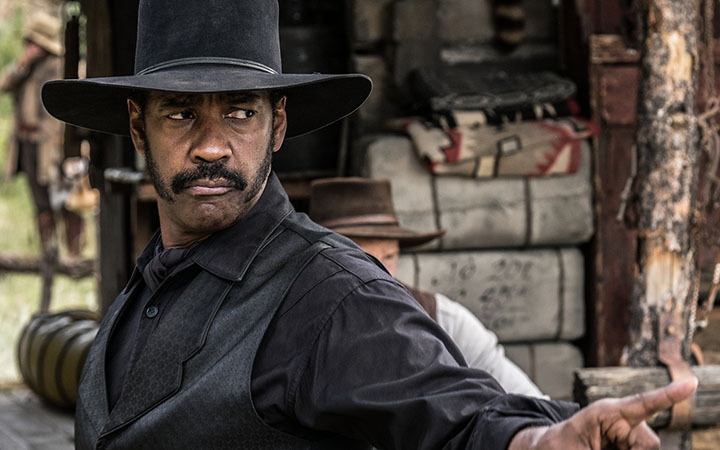 Denzel Washington plays bounty hunter Sam Chisholm. The star here is clearly Denzel Washington—his collaboration with Fuqua in Training Day brought him an Oscar, and the two also worked together in The Equalizer. He plays sure-shot bounty hunter Sam Chisholm, who comes to the aid of a small frontier town under the rule of ruthless robber baron Bartholomew Bogue (Peter Sarsgaard) and his murderous cutthroat bodyguards. Bogue has poisoned the water supply, set fire to the church, enslaved the local men to work in his gold mine and demanded that the residents either sell out, move out—or else. Beseeched by a firebrand widow (Haley Bennett) whose husband was killed by Bogue’s thugs, Chisholm—whose very name evokes the title of a 1970 John Wayne western, Chisum—assembles a group to help reclaim the town. The multinational, cross-cultural rainbow coalition looks awesome onscreen, but it feels more like an Old West Suicide Squad—or a colorful team of Avengers assembled by way of High Noon—much more than an organic group of renegades and rogues, despite all the grime, grit, dirt, sweat, stubble and scruff. 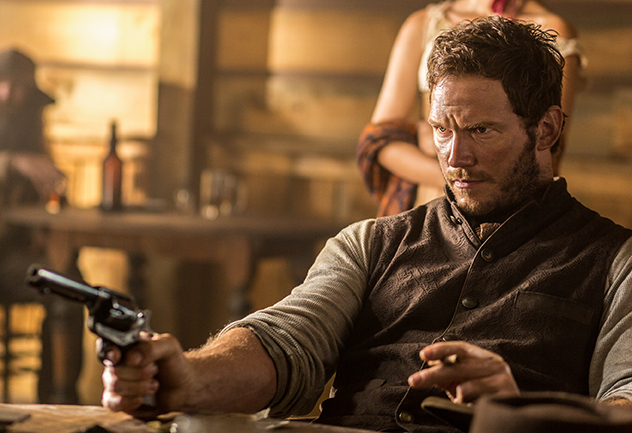 Chris Pratt is heavy-drinking, wisecracking Josh Faraday, whose skill with cards helps him in more ways than one. Ethan Hawke’s erudite former Confederate sharpshooter is haunted by ghosts of his wartime past. His Chinese partner (Byung-hun Lee) can do lethal wonders with any type of blade or firearm. Manuel Garcia-Rulfo is a hunky Mexican outlaw whose vicious skillset makes him a valuable member of the seven. A young renegade Comanche (Martin Sensmeier) likes the gallant cause and wants to come aboard. Vincent D’Onofrio’s big, Bible-quoting mountain man is a holy terror—and an audience favorite. Bullets fly, bodies fall, blood flows, hooves thunder, jokey banter gets bantered, dynamite goes ka-boom. There’s a particularly twisty twist at the end that you won’t see coming. You may catch—or imagine—wispy glimpses of the ghosts of Clint Eastwood, John Wayne and other western icons looming and lurking around the edges of some of the scenes. 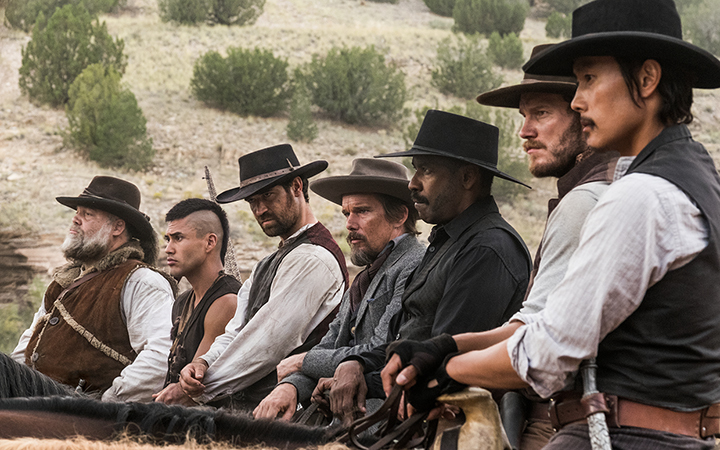 With a winning combo of gunpowder and star power, The Magnificent Seven brings the cowboy past into focus with the Hollywood present. If you like your popcorn sprinkled with old-fashioned, good-guy gusto, it’s as rip-roaring a time that’s come along on horseback in years.